Four firefighters are believed to have died tackling a suspected arson attack at a warehouse in Warwickshire. One crew member died in hospital after being pulled from the blaze at the vegetable packing plant in Atherstone on Stour. Three more remain missing. The blaze was put out on Saturday after burning for more than 12 hours, but Warwickshire's fire chief said he had "grave concerns" for his colleagues. 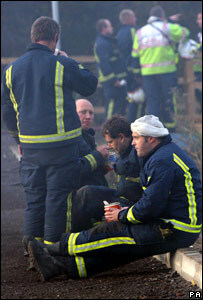 Leading politicians have paid tribute to the courage of the firefighters. Prime Minister Gordon Brown said he was "shocked and saddened" while Tory leader David Cameron said it was a reminder of the dangers facing emergency workers. 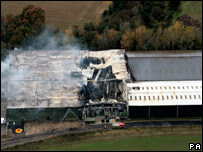 Union leaders said it appeared the incident was the worst loss of life in the fire service for 35 years. Search teams were unable to enter the warehouse on Saturday afternoon to look for the missing firefighters because the building was still unsafe, fire chiefs said. The blaze, which began on Friday evening, was being brought under control but crews were expected to continue damping down at the Atherstone Industrial Estate throughout the night and into Sunday. The county's chief fire officer William Brown, speaking at a press conference on Saturday morning, described it as "the worst day of my career". He said it had been a "catastrophic fire". The senior officer said: "One of our firefighters died last night and three are still missing, and we have got grave concerns for them. "Firefighters operate as a close-knit team, so we are very concerned." He added: "I wouldn't like to speculate on what we found in that building and what has generated so much heat within that building at this time. "But certainly our investigation will unravel this whole thing and we will be able to identify the source of ignition and the reason why there was such a catastrophic fire". The prime minister paid tribute to the firefighters, saying: "My thoughts are with the families of those killed, missing and injured. "I pay tribute to the courage, dedication and service of the firefighters. We stand ready to help in any way we can." Matt Wrack, general secretary of the Fire Brigades Union (FBU), told BBC News the potential loss of four lives would make the incident the worst loss of life among its members since 1972. Mr Wrack said: "We are devastated by the loss of our colleague who died in the line of duty in Warwickshire. We are deeply concerned about the three firefighters who remain missing. "Our thoughts are with the families, friends and colleagues who have been stunned by these events." 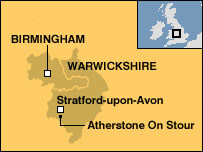 It is believed that warehouse staff were in the building, near Stratford-upon-Avon when fire broke out. An FBU spokesman said crews would have been sent in if they thought more civilians may be inside. Up to 100 firefighters and five ambulance crews were called to the scene and up to 16 fire engines were used to tackle the blaze. Police said they were treating the blaze as suspicious. Bill Holland, Assistant Chief Constable of Warwickshire Police, said: "A joint investigation will commence once the fire is out and it is safe to go into the building." Fire crews from Warwickshire, Herefordshire and Worcestershire and the West Midlands were called to the blaze. West Midlands Ambulance spokesman Murray MacGregor said he understood "large parts" of the roof had collapsed and said the three firefighters who were unaccounted for had not been seen since early in the evening. He said hopes of finding the three missing firefighters safe and well had "pretty much faded now". Local resident Ben Shimmin, who lives in a village near the scene of the fire, said the warehouse was on the site of a disused airfield, with the nearest houses about three-quarters of a mile away, but there were other industrial buildings nearby. In 1972, seven firefighters died while fighting a blaze at a warehouse in Kilbirnie Street, Glasgow.